The 2012 Lincoln Stars tryout camp concluded with the second all-star game held yesterday at Ridder Arena on the campus of the University of Minnesota. 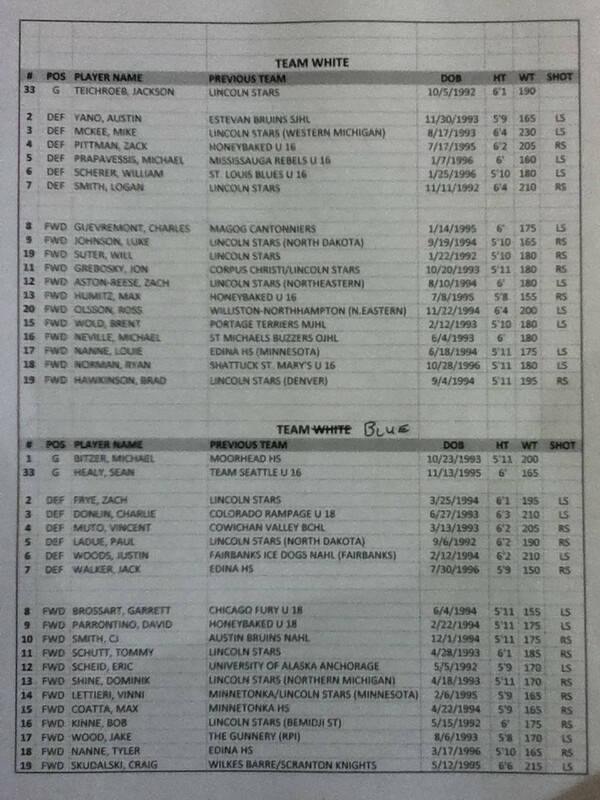 Click here to see the roster sheet from this game. A total of six players who participated in the first all-star game were asked to play in the second all-star game. Those players were: (G) Sean Healy, (D) Michael Prapavessis, (F) Tyler Nanne, (F) Ryan Norman, (D) William Scherer and (F) Craig Skudalski. Healy, who was on Team Blue, did not play in this game. Just my guess, but I bet the Stars invited him to the second game to act as an emergency backup if either Jackson Teichroeb or Michael Bitzer couldn't finish. This game was played over three periods, 15 minutes each. Both teams played to a scoreless 0-0 tie after the first period. In the second period, Team White got on the scoreboard first when forward Brad Hawkinson scored on Blue goaltender Michael Bitzer. Hawkinson collected a rebound in the slot and while falling, jammed the puck past Bitzer. I was told later that Zach Aston-Reese, who was right there with Hawkinson, may have also got a stick on the puck before it went into the net. Regardless, White took an early 1-0 lead. Team Blue got on the scoreboard later in the second period when forward Vinni Lettieri scored on a 2-on-1 thanks to a nice assist from forward Jake Wood. Team Blue added another goal in the second period to take a 2-1 lead when forward Garrett Brossart scored on a goal-mouth scramble. At the second intermission, Team Blue hung on to a 2-1 lead over Team White. Both teams exchanged scoring chances in the third, but both Bitzer and Teichroeb stood tall. In the last minute of the game, Team White pulled goaltender Jackson Teichroeb for the extra attacker to hopefully tie the game. However, it was forward Jake Wood who scored an empty-net goal to seal the victory for Team Blue. Michael Bitzer gave up just one goal during the game, and Jackson Teichroeb gave up just two goals. I will say that Blue definitely had more scoring opportunities in this game compared to White, and Teichroeb had to make a lot more saves compared to Bitzer. Some of the saves Teichroeb made were highlight reel stops. My MVP of Team Blue goes to forward Jake Wood who finished with one goal and one assist. Wood was one of the top three non-veteran players at camp in my opinion. He is a bit on the small side (5'8", 170 pounds), but he plays like he's 6'4", 200 pounds. Great hands, good speed, and he throws his body around with abandon. My MVP of Team White goes to goaltender Jackson Teichroeb who played very, very well. Without Teichroeb in net, Team Blue could have easily scored 5 or 6 goals. In my opinion, Teichroeb was the best goaltender at camp in terms of consistency. He never had a bad game. That's it for the camp recaps! I'm hoping to post a few more article related to the camp in the next couple of days. First off, I want to post a quick review of the camp tomorrow. I also took a number of pictures (I'm definitely not a photographer) during the camp that I want to share with everyone also. Also, I'm thinking of posting some goal stats and a B³ first-team from camp and a honorable mention team. Thanks to all who followed the blog this past weekend. I really appreciate the support. Special thanks to BellTolls for helping out back in Lincoln by posting all of the Twitter updates and the rosters. Without his help, I would have had to work a lot harder. Good stuff all weekend! Sounds like it was a fun three days of hockey.